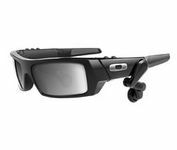 The OakleyÂ® Thump 2 with 256 MB of memory is built around the hard-edged style of OakleyÂ® GASCANâ„¢ eyewear. It allows you to listen to music virtually anywhere with speaker booms that adjust easily for a customized fit, and then swing out of the way when you need to hear your environment. For all-day comfort, the durable frame is made of lightweight O MATTERÂ®.